The sister and I went to see George Romero's new zombie flick Diary of the Dead last night. The movie was pretty good, though it just kind of ends abruptly, gruesomely, and with not a lot of closure - is that what Romero was going for? (WARNING: gruesome picture from the movie at the end. Don't say I didn't warn you). Since it was Friday, she wanted to veer away from meat (ironic in retrospect, considering the movie we saw). Bottom line: we were looking for sushi - the closest sushi place to Arundel Mills (the only place in the area showing Diary). The closest one I could find was the Sushi King in Columbia, so we went there. I almost turned heel when we walked in the door and saw fifteen people standing around, waiting to be seated. I did turn around when the maitre'd told me she didn't know exactly how long the wait would be, but it would probably be about 30 minutes to an hour. It was very busy, which means it's probably good, so I will go back. Fortunately I knew of other places to go. A few months ago I went to the nearby Mirchi Wok - also right on Dobbin Road, and nestled behind a McDonald's and a Wendy's, and next to the Mango Grove. Mirchi Wok is a Chinese-Indian restaurant with an okay buffet. Mango Grove is a vegetarian Indian restaurant, whose buffet I have never tried. Neither place was crowded, and I let Cathy choose. We went for Mango Grove. I'm not kidding about Mango Grove being a vegetarian place. Everything on the menu is either vegetarian or full-on vegan. For some reason I wasn't worried, as I usually am when I go to a "vegetarian" restaurant. I have had some bad experiences with "vegetarian" food. Not vegetables, or meatless/fishless/diaryless/eggless dishes, but food specifically made "vegetarian". For example, the last time a Boca Burger passed my lips was a very long time ago. And that Morningstar Farms line of "meat"? That shouldn't be forced on anyone. But I admit that there is good vegetarian and vegan food out there (hey, Roopa) - I just haven't found much of it in the freezer section. I just say that to tell you how totally blown away I was by some of the food at this place. I admit: I am usually kinder than I probably should be (yes, the Café Hon review, and yes, the Golden West review - though I still stand by the things that I did like). But once we got past the long wait to give our order (I think we sat there for 10 minutes in a mostly empty restaurant), this place truly impressed us. Plus, there were so many dishes we were not familiar with at all - the typical chicken tandooris, vindaloos and other characteristic dishes of Northern India that weren't here at this mostly Southern Indian restaurant. 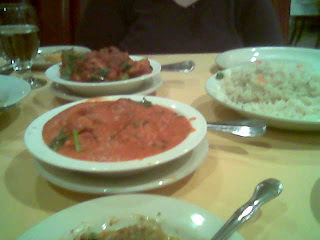 It was like the first time we had ever visited an Indian restaurant, all over again! This is our tangy potato-chickpea appetizer, which was on the specials menu. I am embarrassed that I didn't write down the name or anything. I have no idea what this was called (except that "batata" - or "potato" - was in the name - that's all). It had a kick. Chickpeas, potato, pieces of onion and tomato, in a tangy combination of tamarind, cilantro and - I believe - yogurt. Eight went for $6, and twelve for $8. I had that with a ridiculously large Taj Mahal, which I couldn't finish. That was the proprietor's recommendation. Cathy had a tasty, meaty (not real meat) jackfruit stirfry with onion and green bell pepper ($12). I forget the name, but it was another special and another recommendation on the part of the proprietor. I got the nargissi aloo ($13). As the menu says, it is: "Scooped potatoes stuffed with an exotic blend of vegetables, mild spices, nuts and cottage cheese" and simmered in their "house special 'Makhani [tomato butter] Sauce'". This is obviously not one of the vegan dishes, but is still vegetarian. The sauce was probably the best makhani sauce I have eaten in about a year or two of constant helpings of murgh makhani (chicken in butter-tomato sauce). Very filling - only five balls of nargissi aloo, with my sister helping me eat it, and I still had enough to split the difference with her and take some home to eat for breakfast. We had a big helping of basmati pulav (pilaf) to go with it (complimentary) and some garlic naan. I have had better garlic naan, but it wasn't bad. 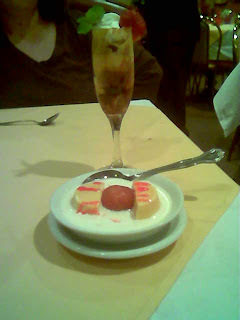 For dessert Cathy had the mango chocolate mousse - another special of the night - and I had the baadal jaam: a warm gulab jamun sitting between two frozen halves of mango kulfi in cold sweetened milk (rabri). I probably should have gotten the mousse, because this wasn't much to write home about. I could have gotten a better dessert at any Indian buffet, putting a gulab jamun in a small bowl and pouring rice pudding on top of it. It was a little difficult to eat the kulfi and the rabri was pretty weak. It was the only really weak part of the meal. The meal was $61 - after tax and 20% tip it was almost $75 for the two of us. It was good, filling vegetarian food, and a perfect Lenten Friday alternative for the Catholic who doesn't feel like fish again. And then we went and saw a movie where dead people eat living people. That's definitely not vegan! Mmmm. Dad. This is the lead heroine's mother, eating dear old dad. Definitely not on the menu at Mango Grove. 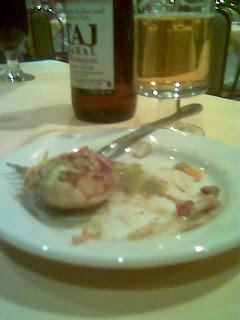 Hee hee - though I did warn you :) The food was much better than "dad" would have been. Do you know what their lunch scene is like? I work right around the corner, but I'm afraid it might take too long to grab lunch there. Sounds expensive, too!